At more than 100,000 tons, laden with warplanes and missiles and with 5,000 men and women aboard, the American Nimitz Class aircraft carrier USS Theodore Roosevelt anchored at Portsmouth has British defense chiefs talking down military cuts. The Roosevelt – known to her crew as Big Stick – is currently moored off Portsmouth because she is simply too big to dock in the port. Serving alongside the thousands of US sailors and marines, as part of an exchange program, are six aircraft handlers and a navigator from the Royal Navy. In a statement on the Ministry of Defence (MoD) website, Britain's First Sea Lord, Admiral Sir George Zambrellas, lauded the US-UK defense relationship. “It is excellent to see US Navy carrier steel in Portsmouth. The carrier is in the UK for five days, having made the initial transatlantic leg of her round-the-world operational mission to project US military power around the globe. But the arrival of so potent a symbol of American might comes at a time when civilian and military defense chiefs on both sides of the Atlantic are airing their concerns over Britain's willingness and capacity to commit to the symbolic NATO contribution of 2 percent of gross domestic product (GDP). British Defense Secretary Michael Fallon downplayed fears. 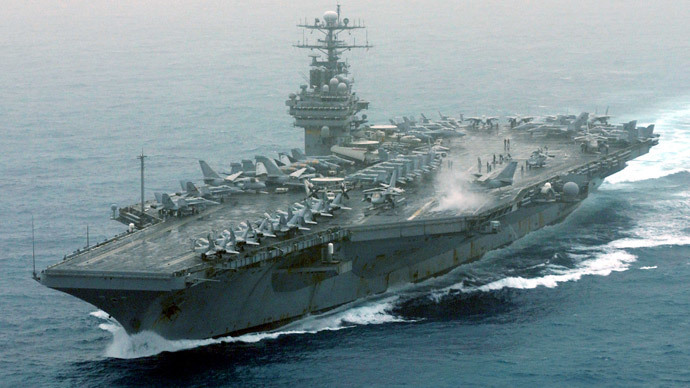 “The USS Theodore Roosevelt’s visit shows yet again that UK/US relations are as close as ever. Ten days ago, I was the first of his counterparts to meet incoming Defence Secretary Ash Carter. Yet behind this Atlanticist ardor, a narrative of fear over defense cuts has come to dominate in recent months. Writing in the Telegraph on Monday, Fallon sketched out the broad range of threats he believes Britain confronts. “In Eastern Europe, Russia is subverting democracy – seeking to change international borders by force and destabilizing a sovereign state,” wrote Fallon. Yet he downplayed concerns about impending strategic impotence, and to some extent buttressed the view on defense taken by Prime Minister David Cameron, writing: “Our Armed Forces now rest on firm financial foundations. “We have a bilateral agreement between our two countries to work together. It is about having a partner that has very close values and the same goals as we do,” explained Odierno at the New America Foundation’s ‘Future of War’ conference. Despite fears of British military decline – many of which were expressed in a much-hyped but poorly attended Commons debate on defense reductions two week ago – UK defense spending remains the sixth highest in the world.